Mother nature, most amazing and the biggest color pallet serves us a variety of hues and colors. Be it your home garden, park or a tourist spot, the colors stimulate our brain more than anything else around. While browsing those flowers, butterflies, birds you may feel spellbound. The mesmerizing and hypnotizing power of colors can be soothing, arousing and nostalgic. Then you suddenly realize that Zinnia, Poppy, Rose, Lilly, Tulip with RED hues are grabbing and centralizing your attention. Oh! Red is your favorite color? What about your wardrobe? 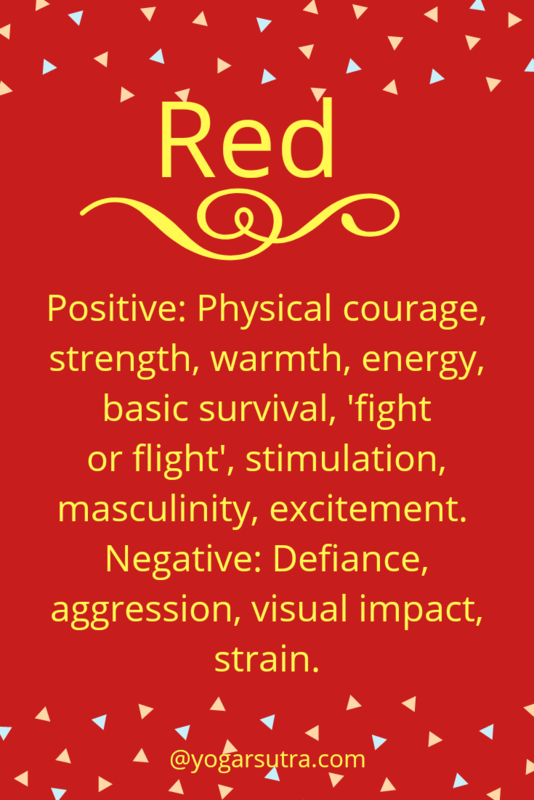 Are hues of Red dominating in your life? From clothes to the wall, cars to flowers one color that attracts us most is definitely our favorite color. 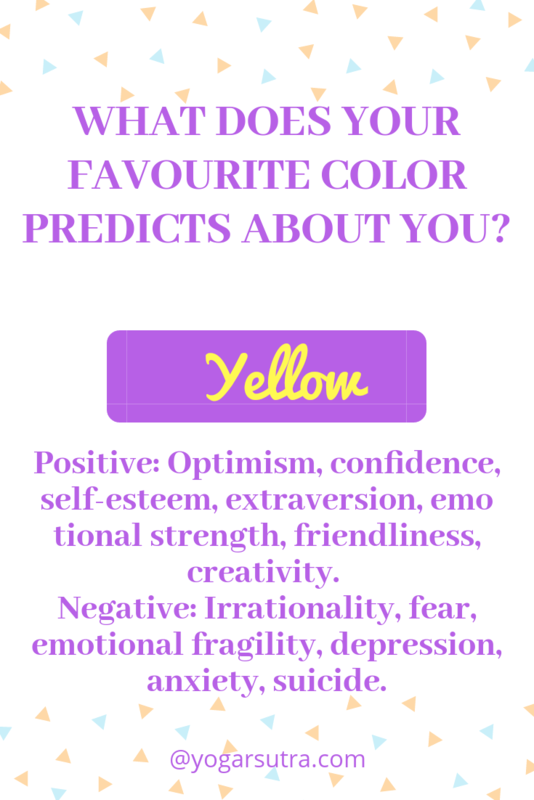 What Does your favorite color predict about you, your strength, weakness? Positivity or negativity involved with that? We need to know about color psychology to find all the answers! Disclosure- Clicking some of the pics here may take you to Amazon Shopping Page. 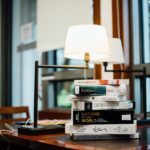 Your purchase may help in running this blog, not costing you a dime. So, Happy "Cyber Monday Deal Week" and A "Merry Christmas"! The science behind color psychology? Colors are familiar and comforting. One of the first things we learn as very young children, even before we learn how to read, write or count is color. Newton observed that color is not inherent in objects. Rather, the surface of an object reflects some colors and absorbs all the others. We perceive only the reflected colors. Thus, red is not "in" an apple. The surface of the apple is reflecting the wavelengths we see as red and absorbing all the rest. An object appears white when it reflects all wavelengths and black when it absorbs them all. Red, green and blue are the additive primary colors of the color spectrum. Combining balanced amounts of red, green and blue lights also produces pure white. By varying the amount of red, green and blue light, all of the colors in the visible spectrum can be produced. The Colors having low wavelengths like soothing green and blue are the most common in mother nature’s landscapes. 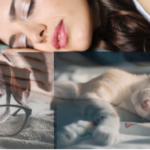 They are well known to improve our concentration and increase efficiency. Hence creating an atmosphere of stress-free and well-being. Alarming red a high wavelength one is very active and intense. No doubt why valentine day is all about this color. That said If you wear red color are likely to draw more eyes too. With the same reason, red lips are most attractive. Above all mellow-yellow, considered by color psychologists as the shade of buoyancy, is ultra-enthusiastic and crisp among all other shades. It is believed to prompt novelty and is best used in work environments where artists, writers, designers, developers and other creative professionals work. An infographic on Color Psychology. What do four psychological primary colors - red, blue, yellow and green, represent? When we talk color psychology, it is relevant to mention about our Body-Chakras; Seven chakras and the individual colors of their centers. Chakras are complex energy centers placed along the spine and up into the head and can be activated and balanced with the Yoga and meditation. The 7 chakras in the human body sense the complete range of frequencies entering a person's personal energy field. Each of the seven chakras has a corresponding color matching with the color pattern of a rainbow: red, orange, yellow, green, blue, indigo, and violet (read in reverse order)–VIBGYOR. Each of your chakras is vibrating at a particular frequency and responds to different vibrations (or wavelengths) of light. These colors represent information on different levels: physical, mental, emotional, and spiritual. This information can be used in chakra balancing and chakra healing. We’ll briefly discuss here what color psychology has to say about how those colors can affect you. You can use this knowledge to understand more about the role that chakras play in your life. Note: Chakras are the mysterious (yet real) energy centers in your body. In case you want to know how they can affect our life or how chakras get imbalanced (due to circumstances in your life; READ THIS BOOK. This powerful and interesting book, WHEEL OF LIFE is written by "Anodia Judith". Since after a glimpse of it at my friend's house, I bought this book and reading the amazing creation of the world-renowned author. You can check here. So what color you are wearing this Christmas? 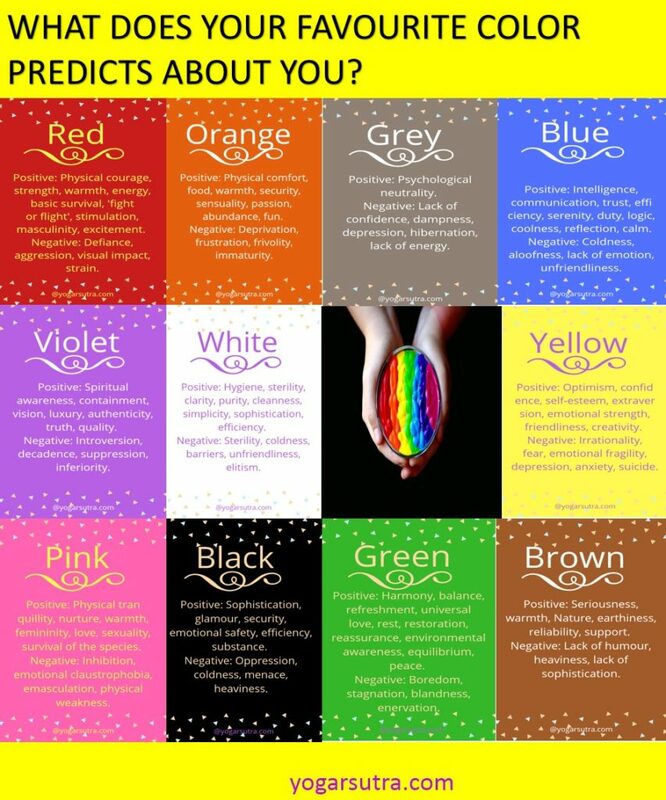 Further, you take help of the color psychology to energize or shift the energy in your chakras. 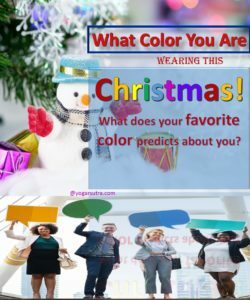 By wearing clothes in that color, especially when it's some great moment in your life or a great festival like CHRISTMAS, meditating with the appropriate colored tones, or even getting creative with how you focus your energy on that color. Hence, by being around the colors of the chakras, you can easily enhance them. Since color is simply vibration, you’ll actually be influencing the chakra centers of your body that vibrate with the same color. 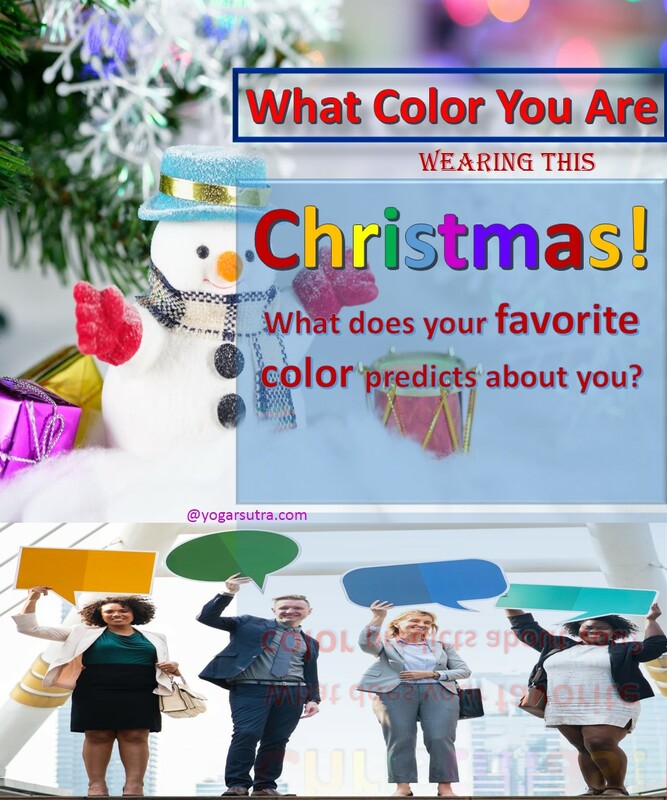 Now it is totally up to you to decide what color you are wearing this Christmas! "Choose here your most favorite one! Good Luck!" You can take accurate guidance from the "Wheel of Life" by Anodea Judith. 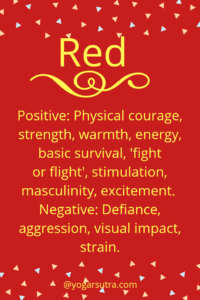 RED represents the ROOT CHAKRA of your body, located at the base of your spine. It deals our basic survival needs – like food, shelter, safety. Positive: Physical courage, strength, warmth, energy, basic survival, 'fight or flight', stimulation, masculinity, excitement. Having the longest wavelength, red is a powerful color. Due to its property of appearing to be closer, RED is the most attention-grabbing. Therefore it has made a prominent slot in traffic lights, ambulance, fire extinguishers, etc. world-wide! This electrifying color can impact your brain to increase blood pressure and pulse rate. 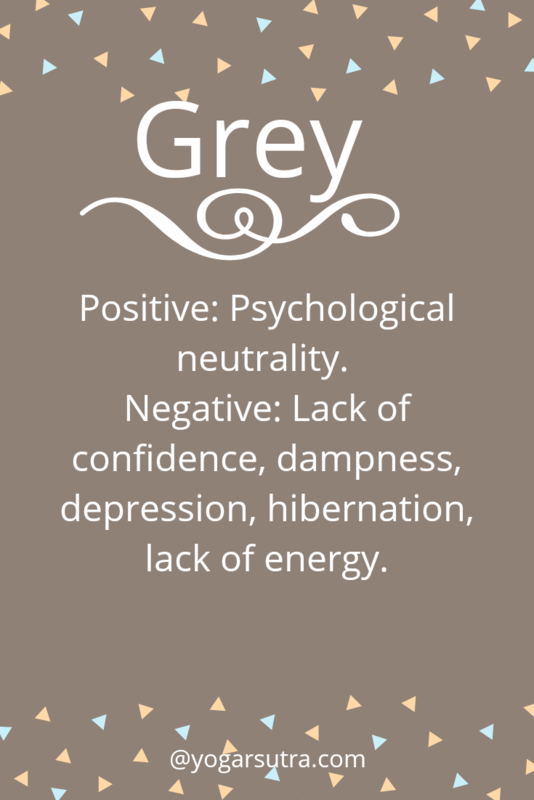 Being a strong color, it can also activate “fight or flight” instinct, quite similar to the situation of facing danger. Your liking for RED predicts that you’re a purposeful but aggressive person. You can fearlessly cross the hurdles coming in your way and with strong willpower, you can accomplish most of your dreams. You’re passionate, strong-willed, and quick-tempered. Check "WHEEL OF LIFE" by Anodea Judith here. 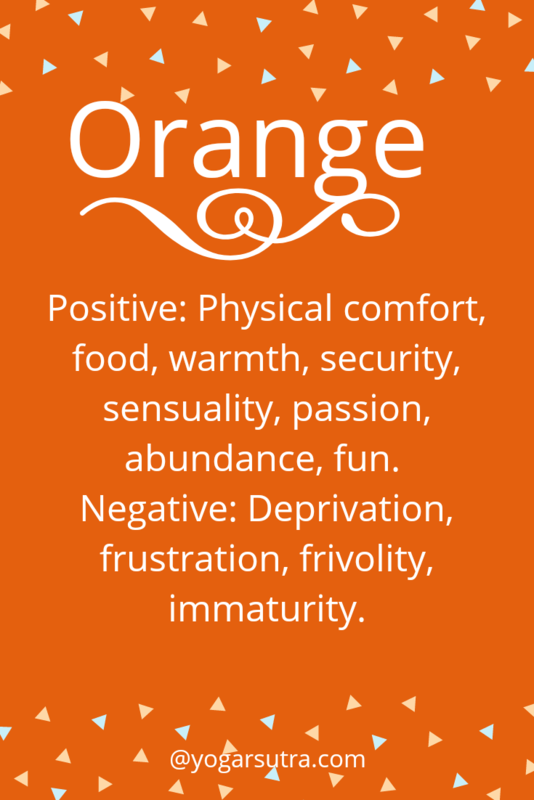 The color of your SACRAL CHAKRA, located in our womb area, between the navel and groin. Centralizes around fluidity, ease of movement, expression, emotions, sensations, creativity, sexuality and intimacy. It is responsible for who we are and how we interact with others and ourselves. A combination of red and yellow, orange is stimulating and a combination of the physical and the emotional state of being. 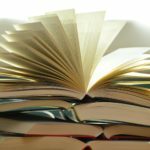 It focuses our minds on issues of physical comfort - food, warmth, shelter, etc. - and sensuality. Orange is a fun color. Negatively, it might focus on the exact opposite - deprivation. This is particularly likely when warm orange is used with black. Equally, too much orange suggests idleness and a lack of serious intellectual values. Colour of our SOLAR PLEXUS, located in our navel center, from the sternum to navel. Yellow represents the fire element. This is the space of our power and transformation. It centers on our ability to overcome inertia and take our best decision and believe on over selves. The wavelength of the color yellow is relatively long and essentially stimulating. 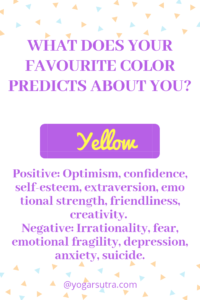 In this case, the stimulus is emotional, therefore yellow is the psychologically strongest color. The right yellow will lift our spirits and our self-esteem; it is the color of confidence and optimism. But the excess or the incompatibility with the other tones in a color scheme can cause self-esteem to plunge, giving rise to fear and anxiety. 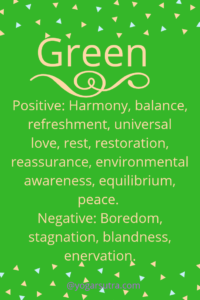 Green is the color of our HEART CHAKRA. It bridges our physical and spiritual nature. This is the fourth one out of a total of seven chakras. Hence centers three lower (physical state) and three upper (spiritual state) body chakras. The element is air hence represent freedom, expansiveness, lightness, and simplicity. 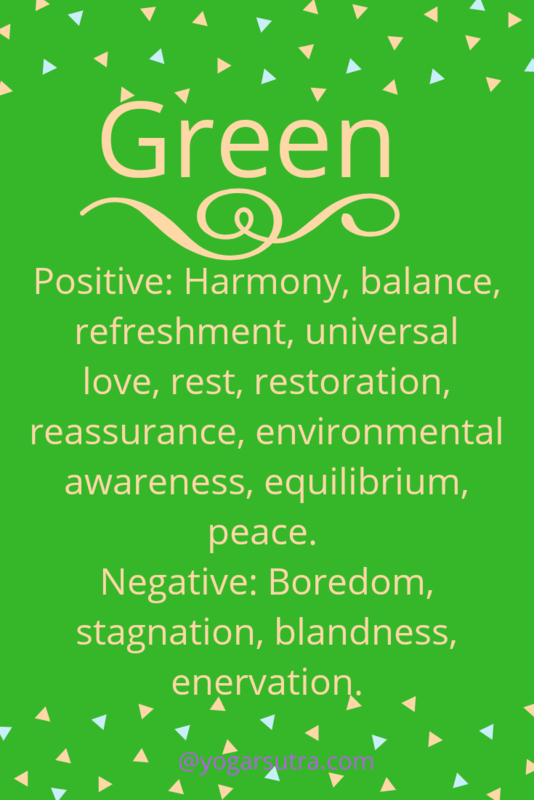 Green is soothing to our eyes and needs no modification, therefore most restful. Being in the center of the spectrum, it is the color of balance - a more important concept than many people realize. When the world around contains plenty of green, this indicates the presence of water, and little or no danger of starvation, so we are reassured by the color green, on a basic level. Negatively, it can indicate stagnation and, incorrectly used, will be supposed as being too mild. 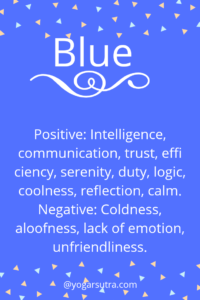 The color blue symbolizes the THROAT CHAKRA. This represents our spiritual nature and located at the throat center. The element is space, an opportunity to create a vast channel of communication. This focuses on communication, self -expression, honesty, authenticity, and communication (verbal and non-verbal). Indigo a variant of blue represents the THIRD EYE CHAKRA, located between our eyebrows. It corresponds to the pineal gland, cone-shaped located in the head center, at the same level of our eyes. The element is light, represents our ability to see- both inner as well as the outer world. Blue has more influence on our mind than body, contrary to red color. The blue color on the wall of your room will increase tranquillity and calmness. Bright blue can brighten your thinking and soft more serenity! And we owe a lot to color blue because of our existence on the PLANET BLUE. We can’t survive without water which again wears hues of blue! No doubt why blue is the world’s favorite color. 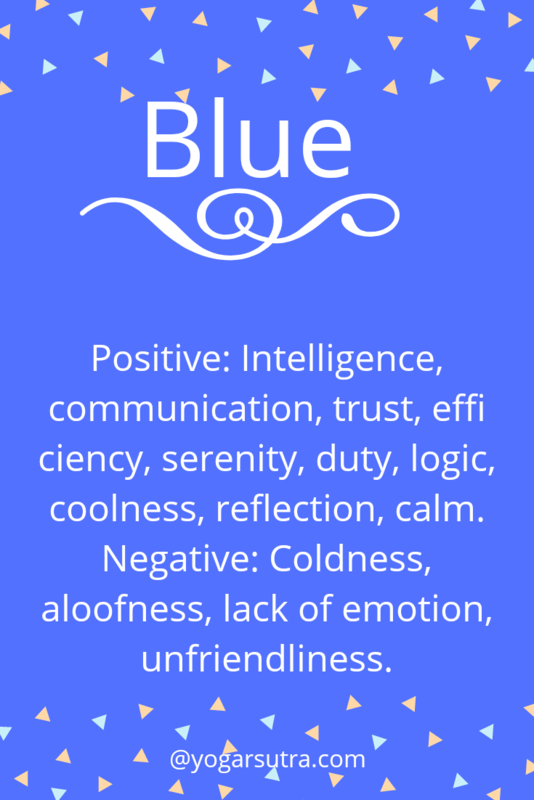 In spite of all positivity, blue is considered as cold, unemotional and unfriendly. Our highest chakra the CROWN CHAKRA symbolizes the color violet. It integrates all seven chakras into the oneness. It is located at the crown of the head. The element is cosmic energy. It centralizes around cosmic consciousness, enlightenment, transcendence, and spirituality. 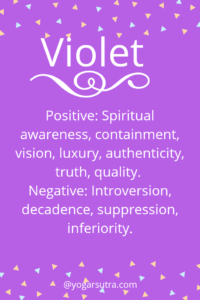 Violet has the shortest wavelength in the color spectrum, commonly referred to as purple. It has the ability to take our awareness to the highest level, into the states of spiritual values. 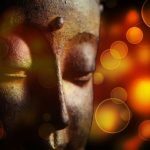 This can make you highly introvert and encourage deep examination and meditation. 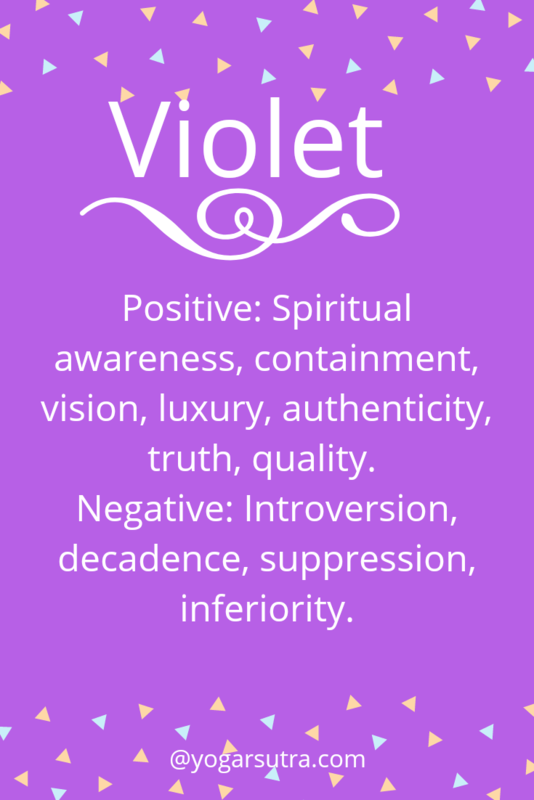 Violet has associations with royalty and usually communicates the finest possible quality. Being the last visible wavelength before the ultra-violet ray, it is related with time, space, and the cosmos. 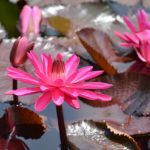 Excessive use of purple can bring about too much contemplation and the wrong tone may relate to something cheap and nasty. Positive: Physical tranquillity, nurture, warmth, femininity, love, sexuality, the survival of the species. Being a shade of red, pink also affects us physically, but it soothes, rather than stimulates. (Interestingly, red is the only color that has an entirely separate name for its shade. Otherwise, hues of blue, green, yellow, etc. are simply referred to as light blue, light green, etc.) Pink is a powerful color, psychologically. It represents the feminine principle and survival of the species; it is nurturing and physically soothing. Too much pink is physically draining and can be somewhat unnerving. When all the hues are fully absorbed you get a black color. The psychological associations of that are considerable. It creates protective barriers, as it absorbs all the energy coming towards you, and it shields the personality. Black is essentially an absence of light since no wavelengths are reflected and it can, therefore, be menacing; many people are afraid of the dark. Positively, it communicates absolute clarity, with no fine nuances. It communicates sophistication and uncompromising excellence and it works particularly well with white. 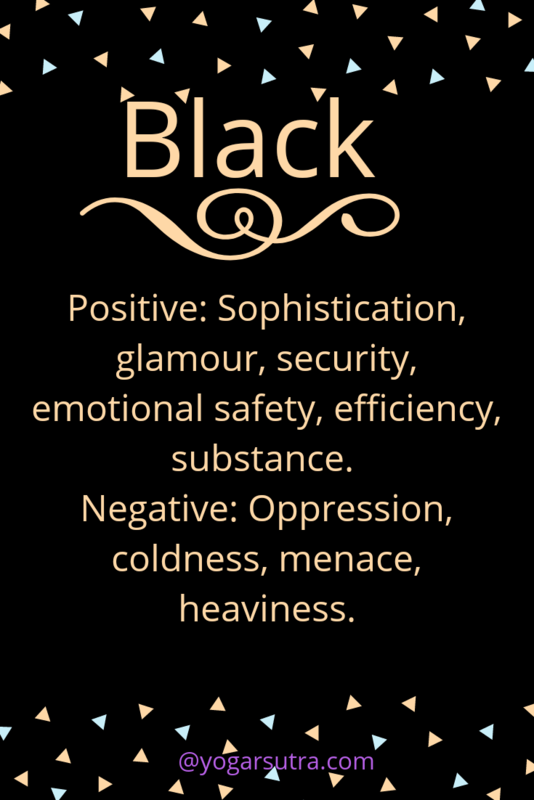 Black creates a perception of weight and seriousness. The truth behind the myth is that black is the most recessive color a matter of not drawing attention to yourself, rather than actually making you look slimmer. Just as black is total absorption, so white is a complete reflection. In effect, it reflects the full force of the spectrum into our eyes. Thus it also creates barriers, but differently from black, and it is often a strain to look at. It communicates, "Touch me not!" 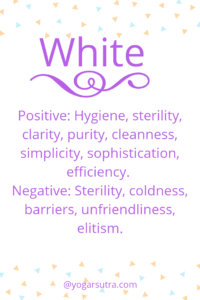 White is purity and, like black, uncompromising; it is clean, hygienic, and sterile. But the concept of sterility can also be negative. Visually, white gives a heightened perception of space. The negative effect of white on warm colors is to make them look and feel garish. 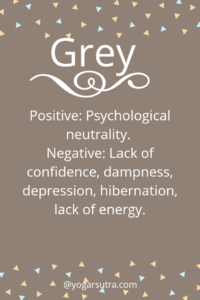 Negative: Lack of humor, heaviness, lack of sophistication. 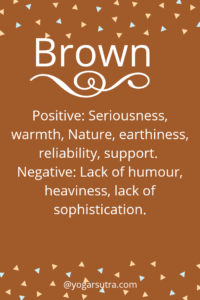 Brown usually consists of red and yellow, with a large percentage of black. Consequently, it has much of the same seriousness as black but is warmer and softer. It has elements of the red and yellow properties. 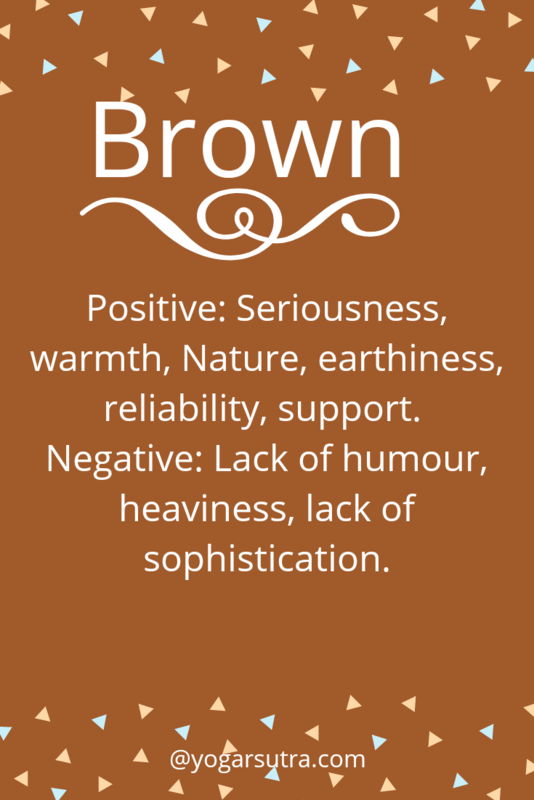 Brown has associations with the earth and the natural world. 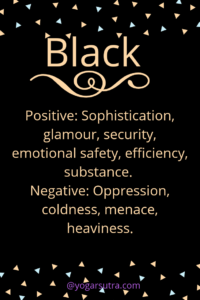 It is a solid, reliable color and most people find it quietly supportive - more positively than the ever-popular black, which is suppressive, rather than supportive. Got your favorite color above? Which one? Well, Mine is pink and I will wear it on Christmas obviously with matching accessories! And, most important of all -there is no single color that has more value than the other. The color is simply what it is - an aspect of the visible light spectrum with its particular frequency. Further, every morning I do yoga and meditation to strengthen my BODY CHAKRA, one chakra each day and that time I try (not compulsorily though!) to wear the corresponding color. I feel refreshed, energetic, positive, and productive all day long! Sleep well and never Procrastinate. Why I'm telling you about my daily routine? Well, simply to have some bonding and know about your side, views. Hence, If you share something interesting and valuable, I'll remain motivated to write further, the cycle will go on and on...! Thanks for reading! You are a wonderful person whatever your favorite color be. Psychologically, you are on the right track. Please do share this article and leave some precious comments for the readers of this blog! If not yet, check "Wheel of Life" by Anodea Judith. Thanks, dear Palak! Did you like all the colors? well, what can I see that if you mix all of them, an outcome is white! Some of your positive aspects are- Hygiene, sterility, clarity, purity, cleanness, simplicity, sophistication, efficiency. Do you agree with these observations? Here am I wondering why almost all I have in my wardrobe and now checking, shoes as well is red. But if you ask my favourite colour I’d say orange. 😀. Now I think it’s actually RED. I’m always attracted to red. Thanks for having me educated on colours. Thanks, Ime for your comments. I agree with you on the point that we like one color more than others. Sometimes there is a shift in liking. 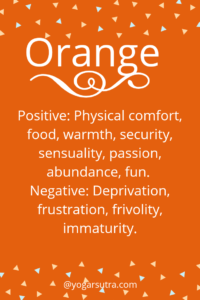 If earlier Orange was your favorite but you find Red more attractive now, indicates your level of confidence is much higher now and you are clearer on certain aspects of your life. Red is a dominant primary color, orange being its derivative!